Yesterday I mentioned that I had been looking on Pinterest for ideas too keep Hollie busy in the summer holidays, well today I turned to Ebay for A little bit of inspiration. I was looking at peg boards, like the Hama beads and dressing up things, as she likes to be a princess (who wouldn’t!). I decided to use the Echo Park Summer Days paper for this card as it is nice and cheery and it has been horribly wet here this week so needed to brighten things up. Also I used the Mojo Monday Sketch 248. I took the colours from the ice cream papers and used them for the accents too and tried to steer clear of happy birthday sentiment as that is all I seem to use. Love the colours of the ice creams! 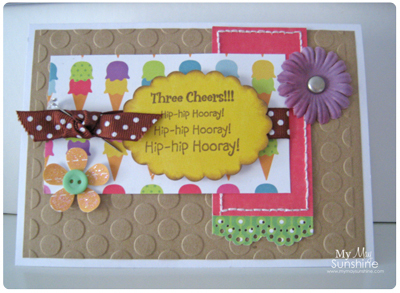 Paper – Echo Park Summer Days | Stamp – Forever Friends Black and Gold | Seeing Sports Embossing folder | Flower punch – EK Success | Button – Sew Sweet | Border punch – Martha Stewart | Flower and brad – Papermania | Ribbon – Hobbycraft | Diamanté pin – Ebay.